Sometimes you need a quick and thrifty dinner that’s just a little bit more upscale, so here’s my gift to you! 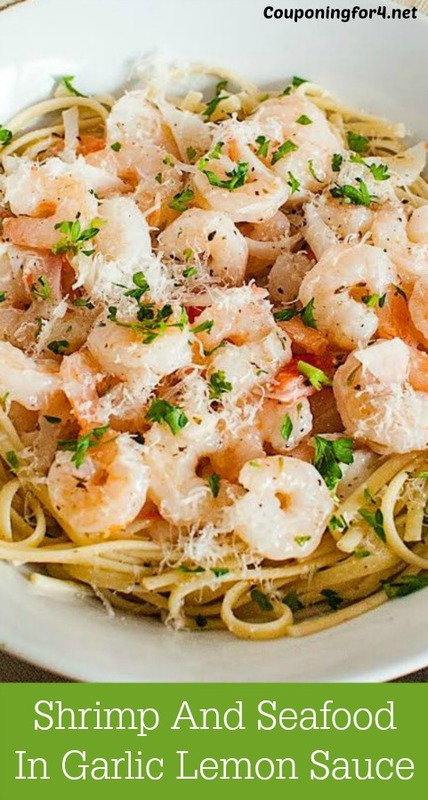 This Shrimp and Seafood Pasta in Garlic Lemon Sauce recipe is delicious and easy, but gives a fancy twist to the meal. Anyone can make it! Boil water and cook the linguini pasta according to the package instructions. Complete this step while making the other part of the recipe and keep the pasta warm after cooking if you’re not quite ready to serve yet. Take the fake crab pieces (we call this K-rab in my house) out of the package and slice them along the grain and into strips. Set them aside. In a saucepan, melt the butter and then add lemon, garlic and Italian seasoning. Stir and let simmer for about 2 minutes. Add your crab strips and mix until thoroughly incorporated and warmed through. Add shrimp to the crab and butter mixture and let it heat through (approximately 3 – 4 minutes). Be careful not to overcook the shrimp. Place pasta into a serving bowl. 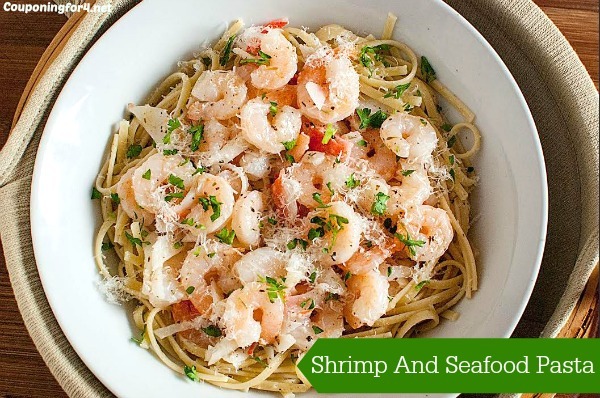 Pour the shrimp mixture over the pasta. You may want to use a spoon for this step to make sure that you don’t spill the butter everywhere. Sprinkle Parmesan cheese over the top to taste. Add fresh parsley on top to taste. Serve immediately and enjoy! Cook linguini pasta according to package instructions. Keep warm after cooking. Slice crab along the grain of the pieces and into strips. Set aside. In a saucepan, melt butter then add lemon, garlic and Italian seasoning. Stir and let simmer for about 2 minutes. Add crab and mix until thoroughly incorporated and warmed through. Add shrimp to the crab and butter mixture and let heat through (approximately 3 - 4 minutes). Be careful not to overcook the shrimp. Place pasta into a serving bowl. Sprinkle Parmesan cheese over the top to taste. Add fresh parsley on top to taste. The sauce and seafood should freeze just fine, but I wouldn’t freeze the noodles. They likely won’t defrost the way you’d want them to, so I would cook the pasta at the time you plan to serve it.